This creamy Kale Wild Mushroom Risotto is hearty and delicious. 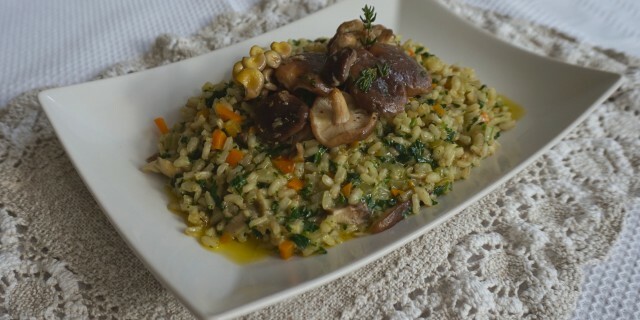 Wild Mushroom Risotto is one of my favourite dishes. I love making risotto because it requires requires love and attention. I also love the fact that it’s a relatively simple dish which lets the ingredients speak for themselves. This recipe is inspired by a beautiful risotto I recently enjoyed on a trip to Switzerland. As I was walking in the mountains, I saw wild mushrooms everywhere. This particular risotto was topped with sweet and nutty baby chanterelles. I have tried to recreate the recipe adding one of my favourite ingredients, Tuscan kale or cavolo nero. I love the nutty flavor of the wild mushroom combined with the slightly bitter and earthy taste of the Tuscan kale. Heat the stock in a pan over medium heat. Heat 1 tbsp of olive oil in a pan and add 2 cloves of garlic, celery, shallots and carrot. Fry gently for 15 minutes until soft. In another pan heat 1 tbsp of olive oil. Add the rest of the garlic and fry the wild mushrooms for 2-3 minutes over moderate heat. Then add the fried mushroom to a lightly greased non-stick baking ray. Sprinkle with fresh thyme leaves and drizzle with extra virgin olive oil. Season with freshly ground black pepper and sea salt. Roast in the oven for 5 minutes or until nicely browned. Remove from the oven and allow the mushroom to cool down a little before chopping up half of the mushrooms. Keep the rest of the mushrooms whole so you can use them to garnish your plates. When the risotto is almost done, add the finely chopped kale and the chopped mushrooms. Cook for 1-2 more minutes or until the kale is wilted. Remove from heat and add the grated Parmesan cheese and mix it into the risotto until you have a creamy texture. Serve the risotto with the wild mushrooms placed on top. Add a squeeze of lemon juice and drizzle a little extra virgin olive oil on top. To finish off, season with freshly ground black pepper and sea salt. One Response to "Kale Wild Mushroom Risotto"